Mango and salad? I already told you before right? I did (Kerabu Mango/Mango Salad). Maybe I could have repeated the same food story and mango I think like donkey times (Mango Cheesecake & Mango Mocktail)? Thus, mango is a favourite for all sort of dishes (Aam ki Achaar & Indian Mango Chutney)? If you are asking me, undeniably. But when salad is a concern on our dining table, most of the time it must be the Asian style. As long as salads packs our Asian and Malaysian customary tastes, oh-my, our meals will be truly a delight and we actually have salad as a side dish for our rice instead as a starter, nibbler or appetizer. That's how it has been for us for as long as I can recall and since I have already showcased mango in our Malaysian style, I decided I will take on the Cambodian side to a mango salad (Cambodian Sour Fish Soup). Pretty much not much of a difference in the ingredients. I mean, what can be different? Our Asian cooking is all about more or less the similar ingredients right? Of course (Kerabu Kacang Botol, Vegetable Raita, Asian Watermelon Salad & Shrimp Pad Thai Salad). 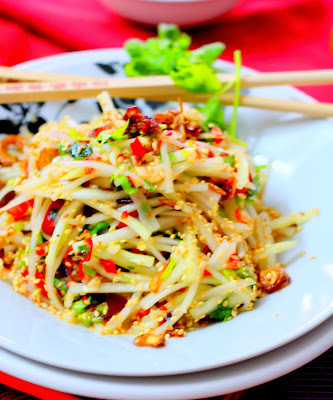 Cambodian Green Mango Salad? Obviously, green mango, and then garlic, shallots, chillies, coriander leaves, sesame seeds, sugar, oil and of course, we must need salt for this vegetarian version Cambodian Green Mango Salad (Mango Cucumber Salad, Penang Acar & Cucumber Yogurt Salad). I medium size green mango - remove skin and seed, slice as thin as possible. Fry shallots in oil till crispy and crunchy. Remove and tip in a large mixing bowl (with the oil) alongside the rest of the ingredients. Looks delicious and healthy salad . Hmm no need to remove. Just unsubscribe their feed is good enough so that it won't clutter your FB feed. looks absolutely delicious, would definitely like to have a go at making it. Beautiful salad love the use of palm sugar in it . Vibrant color...... Looks super yummm salad!! You know, I've been thinking the same! So many bloggers and no connection! Only my timeline gets flooded with their recipes! This salad looks really inviting! Very well said. I not only like your straightforward comment but, also the colorful Mango salad. Aaah! 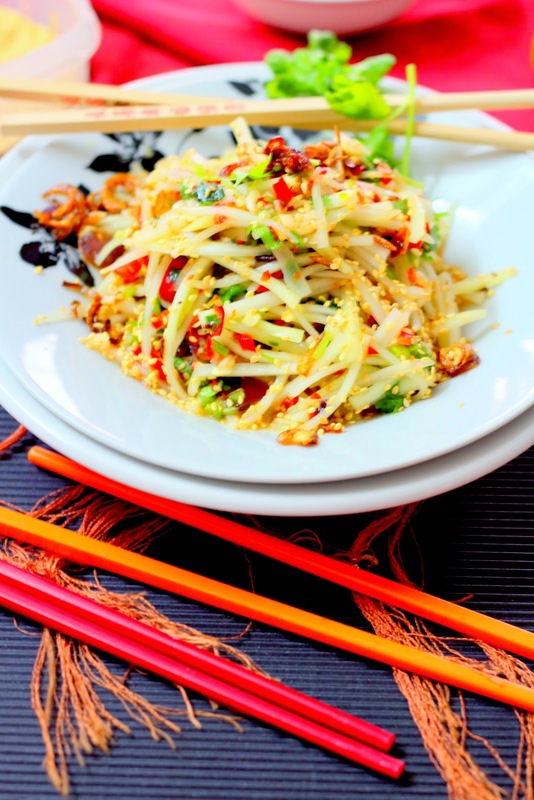 Lovely crunchy salad and so refreshing! Hi Nava, what you said about FB friends is absolutely correct. I fully agree with you but sometimes, I just close one eyes (and at time 2 eyes!) when I feel that they are not worth our time and friendship. Life still goes on and of course, I love your recipes. This mango salad vegetarian is so healthy and refreshing. Great to have it anytime of the day and as snacking too. Yup, good for those who are on diet too!! Great combo for the palette the sweet of mango with a touch of spice with red chili. It looks divine.